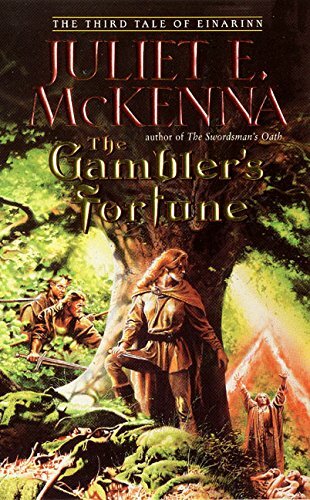 I thought it was time to feature a less well-known fantasy series on the blog, and Juliet E. McKenna's Tales of Einarinn is one I've been reading earlier, with - mostly - a lot of enjoyment. The Gambler's Fortune is the third book in the series, and one more returns to Livak, an itinerant gambler and trickster, now aiding Tormalin efforts against the Elietimm - for a price. The Elietimm, or "Men of the Ice" - established as the main antagonists of the series, opposing the Kel Ar'Ayen colonists and the mainland alike. Although few in number, they use a magic lost to the mainland, and pose a significant threat. - It's balanced and interesting. The talents are put to much more practical use, and earth mages are actually interesting. - It's not too powerful. Although exhaustion is a fairly stereotypical cost, in the "Tales of Einarinn", a mage using their power to a large extent will simply collapse unconscious, leaving him or her at the mercy of anybody. - There are limits: a lot of things simply cannot be achieved using this type of magic, unlike some elemental systems, which feel the need to divide up every single possible use of magic into elental skills. - It restricts the user: an elemental mage cannot use the other magic system. There's also a second type: aetheric magic, or Artifice, used in certain priestly traditions - and by the Elietimm. This is simply done by chanting in the most parts, although as Livak investigates further, it's uncovered that this isn't the only way... Artifice concentrates mainly on the mind and senses, and is linked to belief: but not wholely understood yet. The plot begins with research: Livak believes she has found the rhythm of the aetheric chant in the oral traditions and songs of the "Forest Folk", and, with Usara, a mage sent to facilitate communication more quickly, and Sorgrad and 'Gren, former mercenaries, they begin to investigate. However, an Elietimm enchanter begins to meddle with the border dispute between uplands and lowlands, and steps into the path of our protagonists' enquiries. The result? Magical deception, trickery, kidnapping- and a large dollop of action. The characters are interesting, but I find Usara the most sympathetic, which makes it just a little dissonant when he is treated relatively badly, and this is looked on by Livak as natural. However, Livak is hardly the average protagonist (a gambler and charlatan, as well as an occasional thief), which perhaps gains the reader more insight into her character. However, I didn't particularly like these parts. Several characters also became "designated antagonists", for lack of another word. The reader is meant to dislike them, and, equally certainly, they are Bad. If Jeirran, the manipulated and misguided leader of the upland part of the border conflict had remained in character, - instead of being portrayed, later on, as enjoying abusive behaviour - it would have been a much more realistic conflict. Instead, he becomes rather too much of a "designated" antagonist for my likinbg, through this late addition. Overall, I'd recommend it as a fun, quite light read: and a nice example of elemental magic gone right. It's a good book, but not a great one. This sounds like a great fantasy read. I want to get back into reading some of the older books. I seem to have got caught up with the new releases lately. I have to make time to get back into these, and this one sounds great to add to the list. Thanks.